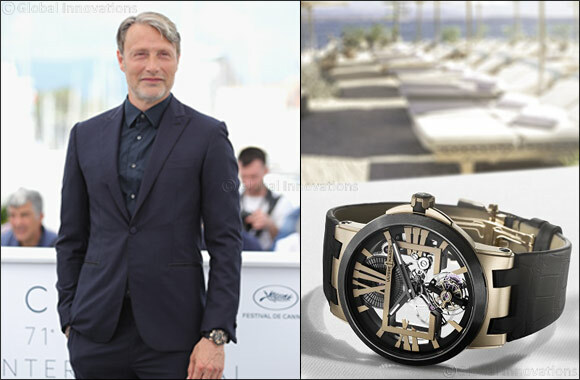 Dubai - UAE, May 16th 2018 – When the golden spotlight of Cannes cast its glow on Danish actor Mads Mikkelsen as he climbed the steps of the Palais des Festivals at Cannes, it reflected on the magnificent Ulysse Nardin timepiece he wore on his wrist. There to present his new adventure film, Arctic, Mikkelsen chose a watch in his image: elegant, sturdy and free-spirited. The Ulysse Nardin Executive Skeleton Tourbillon – in rose gold and black - is a perfect complement not only to the role he plays but also to his off-screen character. It is a watch designed for risk-takers, for those who understand that success is ten percent inspiration and ninety percent perspiration, for men who know that art is subjective, yet beauty need not be sacrificed to efficiency. Directed by Joe Penna, Arctic stars Mikkelsen as a plane crash survivor in a hostile climate who, having missed an opportunity for rescue, must decide if he waits for another opportunity or ventures into uncharted territory and attempt to save himself. Strong and confident like ancient Greek mariner Ulysses before him, Mikkelsen's role as an adventurer on a life-changing expedition through Northern Europe to study the climate changes occurring there is a theme in perfect harmony with the Swiss watch Manufacture's interest in and dedication to preserving the environment. The rose gold and black Executive Skeleton Tourbillon chosen by Mikkelsen for his appearance at the 71st Cannes Film Festival is an aesthetic and technical marvel. With a rose gold case, black ceramic bezel and the iconic executive rectangle at the center of the skeleton movement, the Ulysse Nardin Executive Skeleton Tourbillon is powered by the patented UN-171 movement. With Roman indexes and a manual winding movement, the 45 mm case is complemented by a smart alligator strap. The Ulysse Nardin Executive Skeleton Tourbillon – the Hyperspace model also making its premiere today - is a watch for those who are prepared to stand for what they believe in, stand up to a challenge and stand out in the crowd.